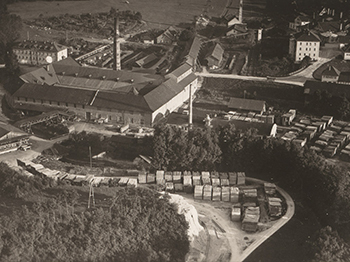 Rosenheim – In the 2016 anniversary year we look back on the successful 150-year history of the Hamberger family business, which is today underpinned solidly by five corporate divisions and ideally equipped to meet the challenges of the future. The company's 150-year history impressively demonstrates that nothing is as permanent as change and there can be no expectation that everything will stay as it is. New opportunities and possibilities unfold all the time and have to be grasped consistently. It was hard work and entrepreneurial ability that led Franz Paul Hamberger, the son of a farmer, to establish his own trading and transportation business at an early age. Because he realised that the advance of the railway would endanger his business, he took a brave step into production. And so he founded a matchstick factory in 1866. This was the beginning and nucleus for Hamberger Industriewerke, whose 150-year existence is being marked in 2016. He chose the district of Ziegelberg in Stephanskirchen as his location as it offered ample space and an ideal infrastructure for his plans, with the Sims river acting as the perfect energy source. Franz Paul Hamberger added on a sawmill in 1867 in order to increase in-house production depth. Having started out with a brick kiln, he added a further pillar to the business in 1872 with industrial brick-making. The baton was handed over in 1912 to the second generation of the family, Franz Paul Hamberger's sons Franz Paul II and Max Hamberger. In that same year another corporate division was added when a toilet seat manufacturing company was acquired. After Max Hamberger's untimely death in 1914 at just 48, Franz Paul II Hamberger took over sole management of the company. With widespread shortages owing to the war, he took the opportunity in 1916 to acquire a small agricultural holding in Ziegelberg – the Gut Filzenhof agricultural estate – so as to ensure the supply of milk for his workforce. The registration of the logo HARO – a term he coined from the words Hamberger and Rosenheim – as a trademark with the Reichspatentamt (German Imperial Patent Office) in 1927 was a pioneering move from a marketing perspective. Following the death of Franz Paul II in 1945, the reins were handed over to the third generation of the family, Franz, Max II and Rudolf. In a bid to further diversify the company, the parquet business division was founded in 1950 and the logo HARO Parquet registered as a trademark. The brickworks division was discontinued following a devastating fire in 1968. Peter and Rudolf II Hamberger joined the company in 1962 and 1964 as representatives of the fourth generation of the family business. The company diversified further in 1976 with the opening of the first HARO DIY store in Ziegelberg. This was followed two years later by two additional stores in Rosenheim and Raubling. The softwood sawmill was reconstructed in 1978, having been constructed originally in 1936, in order to increase capacity, before being converted to hardwood in 1998 in a major expansion. When the German Zündwaren monopoly (Monopoly for Safety Matches) ended in 1983, production of matchsticks was discontinued and the freed up space used to extend parquet production. With the addition of laminate to the product portfolio in 1987, the range offered by the Flooring division was extended for the first time beyond the hardwood sector. A new hardwood sawmill was established in Kleinostheim near Aschaffenburg in 2007 in order to guarantee a secure supply of wood from sustainably managed forests. Dr. Peter Hamberger joined the company in 1996 as the fifth generation of the family business. He has been at the helm of the company group since 2002 together with his father Peter Hamberger. Sales companies were founded in Austria, France, Spain, Switzerland, India, the USA, Russia and Italy in order to promote the strategically important internationalisation of the company. Hamberger has also operated a production facility for WC seats in Sevlievo in Bulgaria since 2003 and another WC seat facility in Kunshan in China, in the vicinity of Shanghai, since 2012. Five independent and also largely legally autonomous corporate divisions currently operate under the umbrella of Hamberger Industriewerke GmbH: these are Hamberger Flooring, Hamberger Sanitary, Hamberger Hardwood, Hamberger Retail as well as the Farming and Forestry division. The central cross-divisional departments of HR, Purchasing, Controlling, Finance and IT are controlled by Hamberger Industriewerke GmbH. The Hamberger Group consists of 21 legally autonomous companies, with nine of these located outside Germany. The company recorded a turnover of over 300 million euros at the end of 2015 with a workforce of more than 2,300 employees.